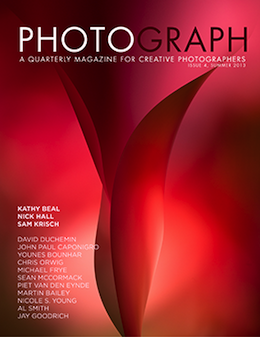 The newest issue of PHOTOGRAPH—a digital quarterly magazine for creative photographers—is now available! This is a gorgeous, ad-free magazine full of great photographs and articles from exceptional photographers who understand that this is not only a technical pursuit, but an artistic one as well. They write as much from the heart as they do from their expertise. Issue 4 is packed with incredible portfolios and Q+As—this time from Nick Hall, Kathy Beal, and Sam Krisch. And there are the usual great columns by their top-notch contributors. Learn more on the PHOTOGRAPH product page and purchase Issue 4 for USD $8. The magazine publishers, Craft & Vision, are offering a one-year subscription for $USD 24—that's four issues for the price of three. Just go to page above, and hit the Subscribe button. The Year One Collection of PHOTOGRAPH is an amazing back-issue bundle that you gives you the first four issues of this visually stunning, education-packed magazine at a 25% discount. Learn more on the bundle page. I really believe the best way to learn photography is to study exceptional photographs, and to listen to voices that not only know the craft, but also practice the art of photography. I hope PHOTOGRAPH inspires you the way it has inspired me.